Corporate identity and team information are essential in each communication. The name of the employee writing and other vital details like disclaimers are some examples of necessary information to include in the communication with the customer. OTRS provides you with the same tools here, as with Salutations, to create a standardized communication form for any one of your queues. As defined in the Queue Settings: Salutations, Templates, and Signatures are combined to ensure a well formed standardized email communication. Signatures can be linked to one or more Queues. A signature is used only in email answers to tickets. 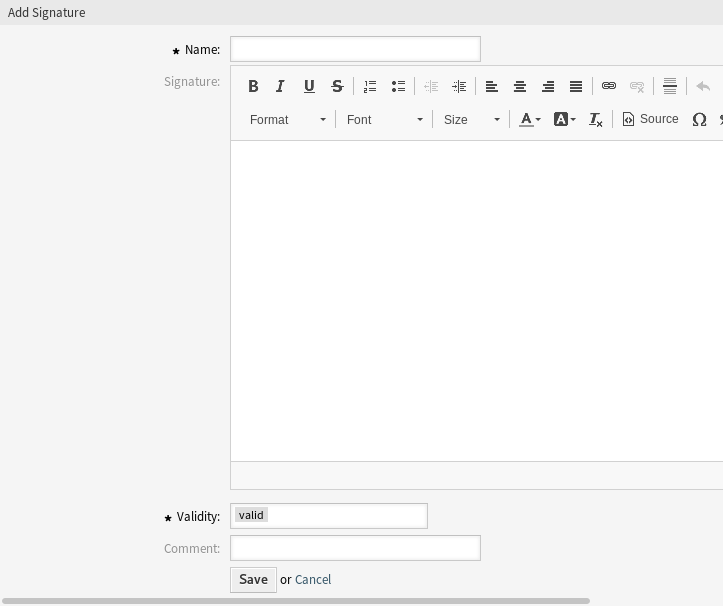 Use this screen to add signatures to the system. A fresh OTRS installation already contains a standard signature. 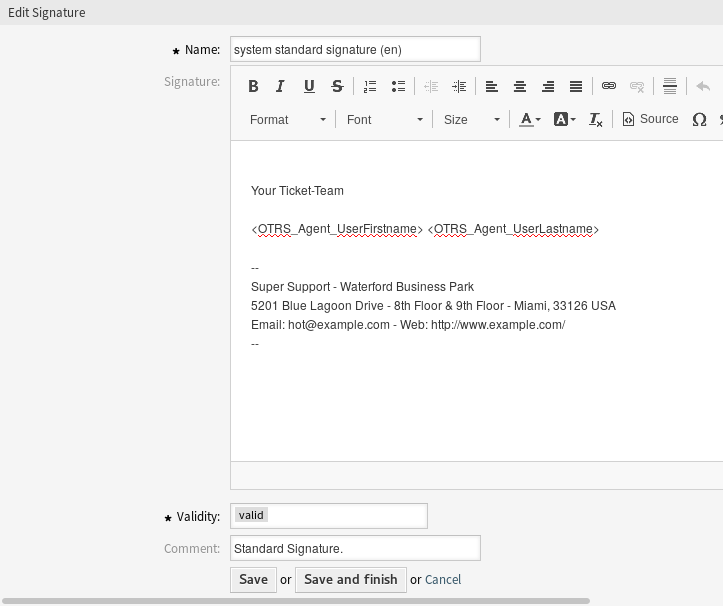 The signature management screen is available in the Signatures module of the Ticket Settings group. Click on the Add Signature button in the left sidebar. Signatures can not be deleted from the system. They can only be deactivated by setting the Validity option to invalid or invalid-temporarily. Click on a signature in the list of signatures. If several signatures are added to the system, use the filter box to find a particular signature by just typing the name to filter. Before invalidating this object, please go to the Queues module of the Ticket Settings group and make sure all queues using this setting are using a valid object. The following settings are available when adding or editing this resource. The fields marked with an asterisk are mandatory. The name of this resource. Any type of characters can be entered to this field including uppercase letters and spaces. The name will be displayed in the overview table. The text that will be placed to the end of new emails. Set the validity of this resource. Each resource can be used in OTRS only, if this field is set to valid. Setting this field to invalid or invalid-temporarily will disable the use of the resource. Add additional information to this resource. It is recommended to always fill this field as a description of the resource with a full sentence for better clarity, because the comment will be also displayed in the overview table. Using variables in the text makes it possible to personalize messages. 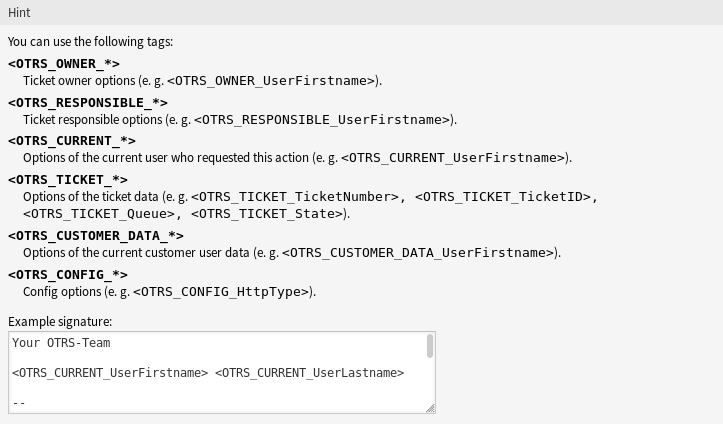 Variables, known as OTRS tags, are replaced by OTRS when generating the message. Find a list of available tags stems for this resource at the bottom of both add and edit screens. For example, the variable <OTRS_CURRENT_UserFirstname> <OTRS_CURRENT_UserLastname> expands to the agent’s first and last name allowing a template to include something like the following.